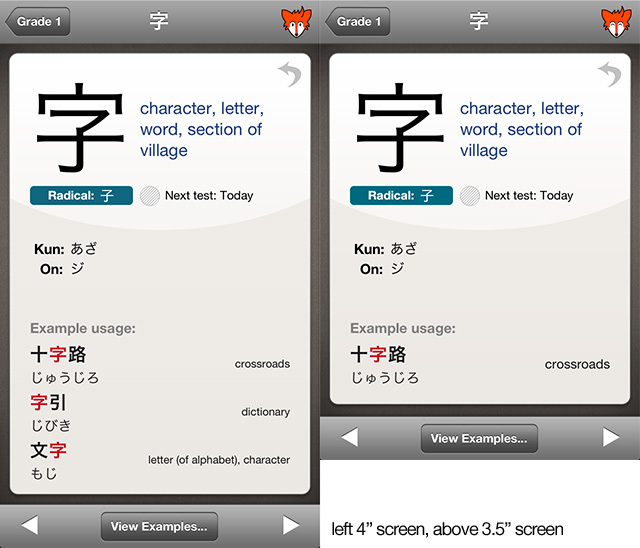 iKanji touch 1.6 also includes new JLPT kanji sets based on those by Jonathan Waller. As there are no official JLPT kanji lists anymore this seems like a fair selection of kanji. No doubt some people will quibble as to why some kanji are in one level or another or why such and such is missing, but its impossible to please everyone. Unless you’re specifically studying for the JLPT the school grade kanji offer more manageable groupings anyway. Up until now iKanji touch hasn’t had very good VoiceOver support – it’s still not great admittedly, but its something I’m working on. Navigating the kanji sets and flash cards should be a lot easier now at least. iKanji will even read example words and kanji readings to you using a Japanese voice – although it’s not up to the standards of the English text-to-speech ones sadly. I’m not sure how useful a kanji study tool is to a partially sighted person but I do hope this is helpful for someone. I aim to get as many of the tests and Teach Me mode working with VoiceOver in future versions. As iKanji uses extensive custom controls this takes a bit more work than usual. ← Hello! Ohisashiburi desu ne! Love the program but would love an iPad optimized version.